One of my favorite pictures hanging on the wall at home is a framed concert poster promoting Elvis-The Concert, and the first tour date in Sweden, back in 1999. "Elvis is coming to Sweden, live on screen," is its message, and when I glanced at it today it made me remember that night, more than nine years ago. My Elvis buddy from the north of Sweden, who was sitting with a couple of friends in the row in front of mine, turned around and looked at me when the first notes of "Also Sprach Zarathustra" started playing. I'll never forget the expression on his face, like he couldn't believe this was really happening. I guess I looked pretty much the same. "This is how it must have felt like for those at a real Elvis concert, hearing that famous theme from 2001 blasting through the speakers and waiting for Elvis to run up on stage and start his show," I was thinking. And then the gigantic curtain with the letters "EP" on it fell away and there was Elvis, live on screen, throwing himself into "See See Rider." Unbelievable! I'd waited for that night a long time, let me tell you. From the moment they announced that there was going to be a European tour and I bought the tickets for me and my brother we counted the days. It felt great reading about the tour in the papers and learning that the show in Stockholm was sold out. Another great thing was actually seeing Elvis's musicians in real life for the first time, playing and sounding just like they did in their days together with Elvis. I was enjoying every second of it, and so were all the others around me, judging by the wild applause. I guess the beginning and the end of the show made the greatest impression on me. "Suspicious Minds" was incredible, and so was "An American Trilogy." During the last few songs, me and my brother went to the front of the stage, and stood there jumping and singing together with a bunch of others who like us just couldn't sit still. And when the musicians came forward and shook hands with us after the show, it was a fitting end to a fantastic night. All this passed through my mind today, after looking at my favorite poster. 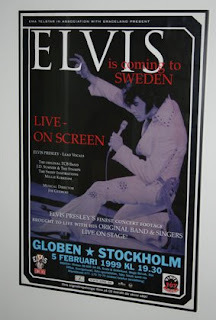 And, yeah, when Elvis-The Concert returned the year after, in 2000, me and my brother saw both shows in Sweden. The European tours in 2001, 2003 and 2005 never included our country in their schedule. But I'm happy I saw Elvis when he was coming to Sweden - I'll never forget it.